This image shows a large live colony of Lophelia pertusa with the red crab (Eumunida picta) in attendance. These crabs are often found in the coral colonies and have been observed making a grab at small fish that swim within range of their claws. Click image for larger view and image credit. Over the last several years, deep-sea corals have been moving to the forefront of scientific and public awareness. Unfortunately, much of the interest in deepwater reefs has been stimulated by the realization that many of these fragile and largely unknown resources are currently being impacted by destructive fishing practices faster than science can allocate funds to describe them. With the continuing depletion of coastal fisheries, commercial fishing vessels are moving into deeper water and exploiting fish and crustacean species that frequently associate with complex coral structures. There is a global need to identify potential coral habitats, map their distribution and abundance, and document any potentially valuable fishery species associated with them. Resource managers can use this information to develop conservation policy, and scientists can use it as a foundation for hypothesis-driven ecological and physiological research. 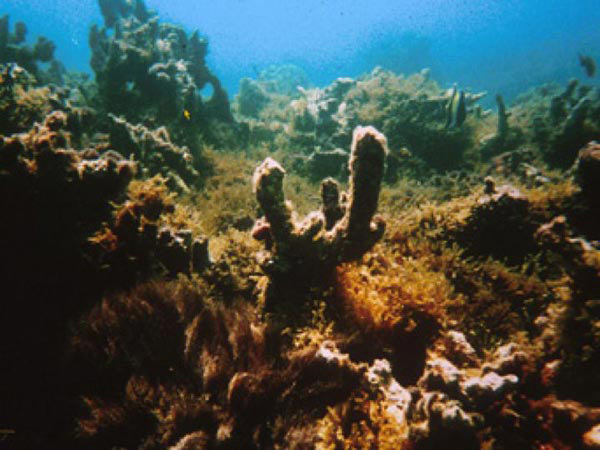 Unlike shallow water tropical reefs, which are popular vacation venues for millions of tourists annually, deep-water reefs are not visible to the public. Dissemination of information through the media and the education system is therefore vital in order to create empathy for their protection. The data gathered during the Florida Coast Deep Corals 2005 expedition will help provide a strong foundation of information on the deepwater coral ecosystems off the Florida coast as well as foster a significant education/outreach element. Refresh the page to see a new item. Deepwater corals can form features more than 150m tall. Deepwater soft corals may be several centuries old. Coral polyps may look like pretty flowers, but they are actually voracious carnivores. Deepwater corals are probably more abundant than their shallow water counterparts. Deepwater corals are found in all the world's oceans, not just in the tropics. Deepwater corals can live in temperatures lower than 4°C and pressures greater than 3600 psi (pounds per square inch). Deepwater corals provide habitat for thousands of species, many of which are new to science. 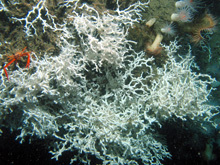 Some deepwater soft corals can grow taller than a human. Deepwater coral skeleton can tell us what the ocean conditions were hundreds of years ago. Deepwater corals may contain important chemicals that can help cure human sicknesses. November 20 Principal Investigator Sandra Brooke provides a summary of the mission. The more we learn about the world of deep sea corals, the more we realize how much remains to be discovered. November 19 A curator from the Smithsonian discovers a profusion of slit shells, colorful and exotic snails that inhabit the deep ocean. November 18 A dive in the expedition's submersible uncovers the deep predators of the Miami Terrace. November 17 After encountering rough seas off the coast of Florida, the scientists continue their dives in search of Lophelia coral. November 16 The "bumps and holes" on the ocean bottom are geat places to look for deep sea corals. November 15 This expedition would not be possible without the wonderful work of the ship and submersible crews. November 14 It's Hollywood meets the high seas as a pair of plucky educators learn the challenges of making movies on a research expedition. November 13 This cruise has been a success, discovering at least three new species and, possibly, a new family, of tiny crustaceans called amphipods. November 12 The team observes an interesting biochemical phenomenon in one of the octocorals—a brilliant blue bioluminescence produced by bamboo coral. November 11 In a dive off of Cape Canaveral, a scientist encounters a diverse collection of deep coral fish, including the enormous ocean sunfish, rattail catsharks and codlings. November 10 The Johnson Sea Link submersible allows researchers to examine the lives of deep-sea organisms in great detail. On this dive, scientists collected corals and discovered a mysterious creature. November 9 Today the team explored one of the largest Lophelia reefs in the western Atlantic Ocean. It's over 500 feet tall and nearly 1 mile in diameter. November 8 See video and photos from the first dive of the cruise, into 2,400 feet of water off of Cape Canaveral. November 7 This year has taught us the destructive power of hurricanes. A relatively new area of study, however, is the ecological importance of hurricanes to natural communities.